Pinterest has got me hooked again! I have another wonderful mask for you. 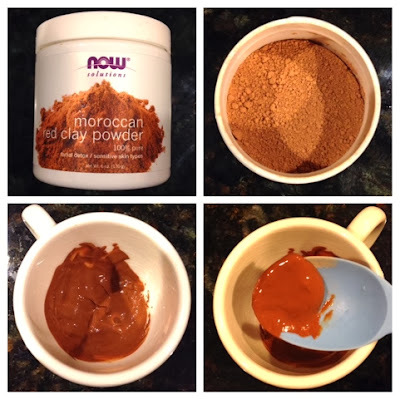 I purchased red Moroccan clay online: here. Received it within a few days and quickly opened the box to try this clay. This has got to be the easiest mask I have ever used. 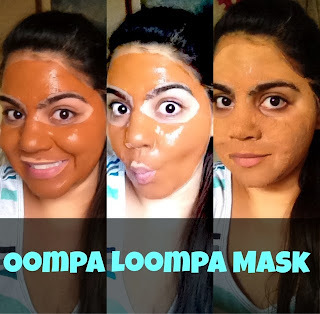 Oompa Loompa faces get ready! Leave for 15-20 minutes... or 30 if you're watching New Girl like me. As you can see in the picture above, once mixed it becomes a smooth terra-cotta-colored paste. Hence, why I am calling it the Oompa Loompa Mask. It makes a generous amount that fully covers the face. It dries rather quickly. And if you have something to say, say it quickly because it also dries rock hard. There ya go, my face looking ridiculous again! Removing the mask is just as easy as the preparation and application. It rinses off comfortably with water. This wonder working mask is great! I tried it with two of my friends and they can vouch for how amazing their skin looked right after removing it. I highly recommend purchasing the clay. Its tendencies to readily cleanse, exfoliate, absorb impurities and detoxify the skin, combined with its ability to improve conditions of dryness, scaliness and to clarify skin texture and firmness make it very desirable. Perfect for sensitive skin in need of detoxification to remove impurities and in need of a smaller pore size and tighter skin tone. This product is guaranteed to be 100% natural.